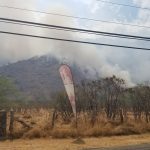 (Honolulu) – Thirty (30) DLNR Division of Forestry and Wildlife (DOFAW) firefighters continue battling a 1,500 acre wildfire in the Wai‘anae Kai Forest Reserve which started Saturday morning around 10. The Honolulu Fire Dept. 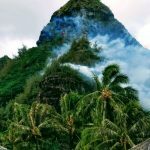 requested DOFAW assistance at noon and Ryan Peralta, a DOFAW fire incident commander, was on scene at 2 p.m.
A wildland fire burning adjacent to Ha‘ena State Park on Kaua‘i’s north shore has closed the park and the popular Kalalau Trail in the Na Pali Coast State Wilderness Park. The Hawaiian monk seal pup, PO3, born on O‘ahu’s Kaimana Beach in late June will be relocated to a remote, undisclosed shoreline area where she can continue her natural growth as a wild seal with less human interaction and other hazards. The decision to move the seal was made following extensive discussion and analysis by experts, managers and scientists from the National Oceanic and Atmospheric Administration’s (NOAA) National Marine Fisheries Service (NOAA Fisheries); the DLNR Chair’s Office and its Divisions of Aquatic Resources (DAR) and Conservation and Resources Enforcement (DOCARE). 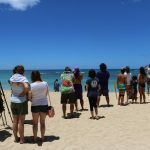 Other agencies involved in managing public and seal safety during its time at Kaimana include the City and County (C&C) of Honolulu Emergency Services Department, Division of Ocean Safety and Life Guard Services, C&C Dept. of Parks and Recreation, the Honolulu Mayor’s Office; and Hawai‘i Marine Animal Response (HMAR). 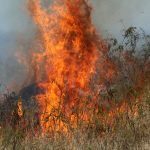 A north shore wildfire burning uphill today toward the state Mokule‘ia Forest Reserve and Pahole Natural Area Reserve may put significant natural resources and endangered species at risk. A crew of 14 DLNR Division of Forestry and Wildlife (DOFAW) firefighters with two water tank trucks and helicopter dip tanks has responded to a fire in the Mokule‘ia area, located east of the Mokuleia Forest Reserve access road and west of Kaala road. The Honolulu Fire Department and Honolulu Police Department personnel are is on scene with two helicopters doing water drops. DOFAW has contracted two type 3 helicopters and a type 1 helicopter for water drops. 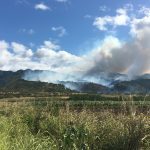 State and county wildfire fighting crews today continued to work to establish a control perimeter around a fire that is burning between the 800 to 1,500-foot elevation at the western edge of Waimea Canyon, amid grassland and haole koa shrubs.